With my GE healed I was finally able to go out yesterday and hit exactly 67 serves, recorded the last 7. Thanks to everyone who provided feedback, I tried to incorporate what I could, here is my progress thus far. I was gonna say day and night difference and I noticed I was comparing it with your dad’s serve! Looking a lot better! Nice racquet drop! Looking better but still some room for improvement on using your legs/hips. Really focus on keeping that tossing arm high to maximize your power/spin. You're 27 but your front foot just barely leaves the ground, and is more of a twisting motion rather than an explosive/power motion. I also noticed that you're dragging your front foot before you serve, which is changing your platform. Compare your plaform serve to Fed's, notice his front foot explosion compared to yours. I see the same level serve before and after 24 hour period, slightly different approach. I can relate to the foot faults though. Keep going for it...at this rate you should be a 6.0 by Sunday. Who needs 10 minute abs when you can do "6.0 by Sunday". Why waste countless years with traditional progression and countless hours wasted on court with coaches when you can progress from 4.0 to 6.0 in a week. This radical new training method includes, older playing partners, using higher player videos for reference, and a wonderful key training forum where you can get the key tips and coaching you need to suceed!. Check out our YT channel for all the information, and sign up today! Lol thank you, first time in my life anyone has ever said “nice racquet drop” about my serve, I’ve always had a terrible hitch ever since i started being an unnatural thrower. Thanks for the tips I agree over time I’ll need to form my motion into being more explosive. You’ve just given me a great idea for a how-to book, it’ll be a NY Times best seller on the TT forums!!! Reminds me of the "Fluent in any language in 30 days" and "Six-pack abs in six weeks" pdf's they use to spam out. "6.0 Futures qualifier in 6.0 months"
Something tells me this thread will have staying power. Contact me for the royalty contract to use it. Compared to before you are raising your left arm and leaving it up longer instead of pulling it down early, you are going more into the court and hitting more into the ball compared to before where you didn't. To be fair I went from 188 lbs at 5’7 (3 push ups max, 1 chin up max) to 160.5 lbs in 10 weeks with a pretty solid outline for a six pack. My offer to you is $3 per book sold, I will be selling hard back copies for $44 and soft back for $25. High speed video is necessary to look at the fast changing parts of the serve. Your 30 fps video only shows one frame during final approach to impact, but 5-10 frames are needed to see the arm and racket changing during approaching the ball. 1) Your upper arm between the shoulder joint and elbow is about at 45 degrees to the horizontal. Compare that angle to high level serves. 2) Your elbow has too much flex, about 140 d., at this time of the serve. It should be near straighter. Compare to high level serve. Golfer's Elbow has been associated with the forehand and the serve. I have not seen details discussed. I've seen a somewhat similar technique used in a few poster's serve videos. TomT was the first one that I noticed using a similar technique. 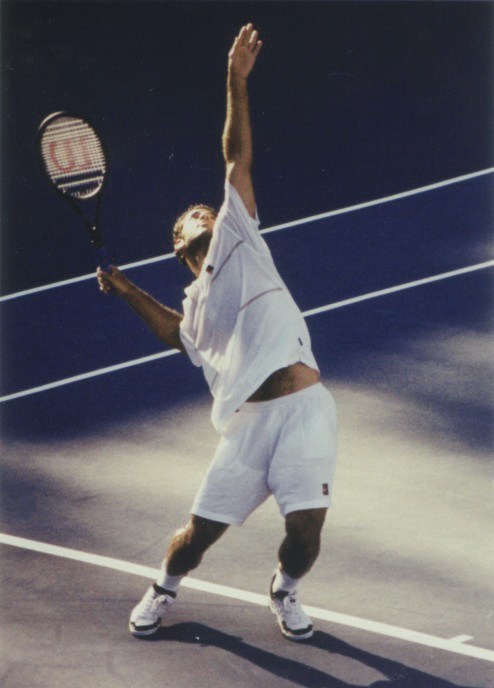 Some of Bigservesofthand's serving techniques use a similar motion for pace. Warning from my experience - About 10 or 12 years ago I was experimenting with a volleying technique to increase the pace of my volley. The flex angle of my elbow was about 90 d. When I tried very hard - using active muscle forces and not stretched muscles - I gave myself an immediate Golfer's Elbow injury (in side of the elbow) - on the first or second try. At the time, I had not heard of internal shoulder rotation (ISR) but that was what I was using to speed up my forearm and racket. I believe that the injury occurred because I used the bigger ISR muscles but the resistance to rotation of my forearm and racket's moment of inertia, with elbow at 90 d., was too high and the tendon suffered a tear. I did not see a Dr. Your elbow angle is not 90 d during ISR, more like 140 d at one point. But in a typical high level serve - when the most forceful ISR occurs - the elbow flex angle might be much straighter and as straight as comfortable at impact. The straighter the arm is the less the moment of inertia of the forearm and racket. With the arm near straight the ISR can produce higher racket head speed and there is less stress on the elbow. I believe that the angle you use increases stress on the elbow in the area of Golfer's Elbow injuries. See high speed videos of high level ATP serves for details and safe examples of techniques. Don't practice that technique until you understand the nature of the timing of the elbow angle in the 30 milliseconds approaching impact. I've posted many times on this part of the serve with many pictures and videos. You need high speed video for feedback on this issue as ISR before impact lasts only about 30 milliseconds. You should also view the Todd Ellenbecker video "Rotator Cuff Injury". Join Tennis Resources for 3 months to view the video. It's 10% of net sales and I retain copyright. Why? None of the other ones did. I don't like clickbait. But I like the doggy. The serve is okay. OP if you're serious you should hire a real coach instead of soliciting advice on TT. Then he will be a 4.5 with less money. Great post thank you, I will record 2 of the serves in slow motion 240 FPS next time I check my serve progress. I sustained a GE injury attempting too many push ups, pull ups, and assisted dips when I was too heavy and too weak. When I had GE it was painful to wash my face and to hit flat serves or serves in general, I have completely rehabbed it fortunately. I am serious but I consider myself my coach, and I sift through the information in this forum and apply what I believe will help me reach my goals. I’ve worked at clubs before teaching clinics, camps, and also basic lessons to kids, and of the 10 coaches I’ve come to known, only 2 had knowledge outside the basics. The best coach I know is Paul Kobelt, his oldest son is rank 500 atm, youngest son is playing d1 at Osu, and daughter is rank 600 doubles I believe. You are foot faulting … I've been doing the same thing. Didn't even realize it until I watched a video of myself recently. Also it looks to me that you are already coming down before you make contact … maybe not touching the court prior to hitting the ball but almost. If you watch the video of Fed he makes contact almost at the apex or just prior. Given that you'd previously been a 5.0, the conspiracy theorist in me is beginning to wonder if you're already a high level player (5.0+) who's trying to build a new tennis youtube channel and using these forums to organically grow it. Either way, I like your racket drop. The more you rotate the more time and distance you give the racket to drop lower. Thanks for the feedback, and creative theory, a couple flaws though. According to the USTA computer ratings, at this very moment I’m still rated 5.0 (although I’ve never beaten a 5.0 player), but I’ve taken 3.5 years away from the game, lost all muscle mass, and had put on 30+ lbs destroying my previous athletic capabilities. Edit: you can’t fake the way I looked playing vs. my dad lol... that was just a disgrace. Your serve might be !! First time in my life I’ve finally figured out how to get a semi-decent drop. I can throw left handed but I throw farther right handed. The curse of the lefties, we learn to do so many things right handed (we live in a right handed world) that it diminishes some of the coordination in our dominant side. On the plus side i guess it helped me become partially ambidextrous. If you can throw farther right handed you might have a more powerful right handed serve, once you got the coordination down? Well, if one can throw far right handed, serving is not that crazy different ?!? I might consider attempting a right handed serve in the future, after I fully learn the correct mechanics on my lefty serve. My right handed forehand is quite good and technically more sound than my left handed forehand. When I hit vs. the wall I always start with 10 minutes with my right handed forehand. If you can throw farther right handed, you might somehow be able to better coordinate your kinetic chain on your right side. I'm not saying you couldn't learn to better do that on your left, but presumably you have been throwing things your whole life with your right hand, so developing a serve might be easier on that side. Too many different things to learn leads to 4.0 CEILING thru constant tinkering creating doubt in crucial situations. How far can you throw a tennis ball with your right hand vs left hand? If you stand at the baseline, can you easily throw it over the opposite fence? What if you stand at your back fence? Standing on baseline, I can throw a tennis ball left handed close to opposite baseline, right handed can throw over baseline. I wish I could throw it over the fence lmao... no idea about a baseball or football. They don't seem nowhere near 105mph in your video, interesting. Perhaps 105 wasn’t anywhere close to going in. Maybe it’s different at the citi open but at Wimbledon, Head had a booth set up to measure serve speeds in a cage where there was a gun to measure the speed but it wasn’t a full length court so you had no idea if the serve you hit was in or out. The serves in this video are slice-flat hit at 80% effort, I was working on technique. In the 36 degree weather, I’d estimate the speed of these serves ranging from 80-90 mph. At the citi open I was hitting purely flat and I have no idea if they would be in on a tennis court. Not on two bounces to the back fence. Try to land your serve in the box and hit above the crossbar on the back fence on the fly. You'll have to wait for spring though. I can hit my flat serve in the one teens, and I can rarely get it to hit above the crossbar. Probably because unlike you I'm under 6 feet tall. can you link to the one you bought? Stop making excuses. Try harder.